Most motorists relate a vehicle pull to the fact that their car needs a wheel alignment, but if the car is still experiencing pull issues after having a complete four wheel alignment ( www.alignmycar.co.uk), what then? It may be due to Lateral Force. 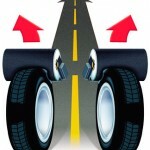 This is the amount of left or right pull force (Lateral Force) created as the tyre rolls along the road, causing the vehicle to drift from the straight-ahead. This is primarily created by the conicity (the amount of flexibility in the tyre on its inner and outer tyre sidewalls) and cannot be detected during standard balancing or wheel alignment service. How can I resolve this pull? The Hunter Road Force Balancer measures the Lateral Force ( for all four wheels) and then suggest to the technician, the best possible wheel fitment plan to your car, countering the pull on each wheel assembly, enabling the pull to be reduced or illuminated.